The Samsung SoundBar HW-N650 is a two-piece home audio system that is targeted towards movie buffs and gamers. It comes in a 5.1 surround sound configuration and costs around RM2,451/SGD699 online. It used to be that when it came to enjoying a theatre experience at home, you’d have to fork out a small fortune just to reach an experience similar to what you’d find at your local cinema. And all too often the speaker systems available were large, bulky, and unwieldy components that required at the very least some knowledge in audio to properly set up and use. But in today’s tech, people want the affordable stuff, and the small-form factor is in vogue. At first, this trend started out affecting the smartphone market, but has now trickled down to things like audio systems as well. 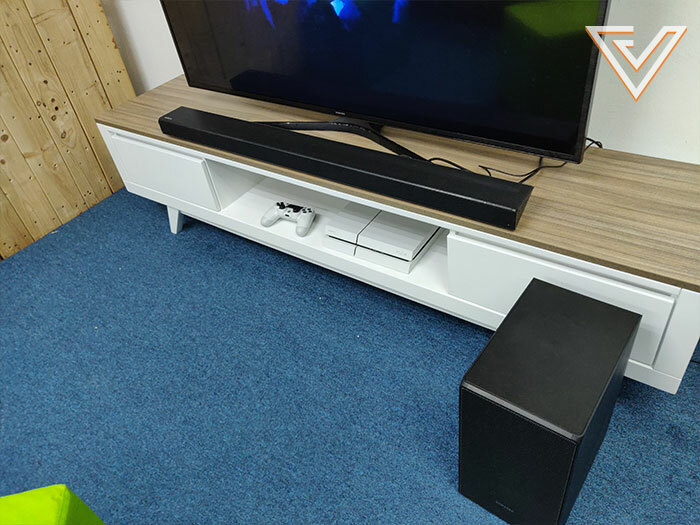 This has given rise to the popularity of the soundbar—simple systems meant to fit within a living room TV set-up with one main speaker bar and sometimes an accompanying subwoofer to provide extra low end frequencies. 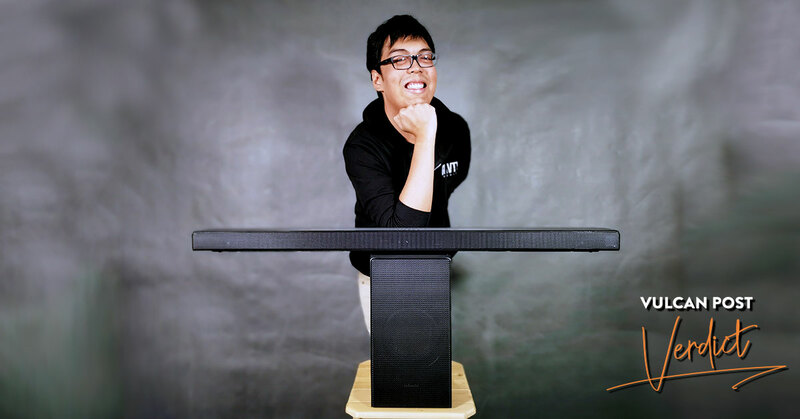 For Samsung, the aim is to capture a chunk of this market and complement their successful existing LED TV business, and respectively, they’ve already released quite a number of these soundbars via their dedicated audio facility in the USA. 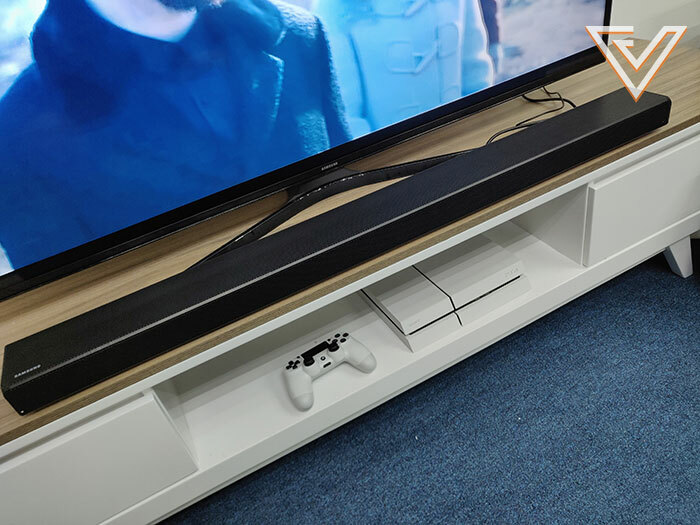 One new model in their line-up is the SoundBar N650 (or just N650 for short), a two-component system that costs somewhere in the region of RM2,451/SGD699 (depending where you look online) built especially for movie buffs and gamers. *Editor’s Note: This article has been updated since publishing to reflect the accurate price. 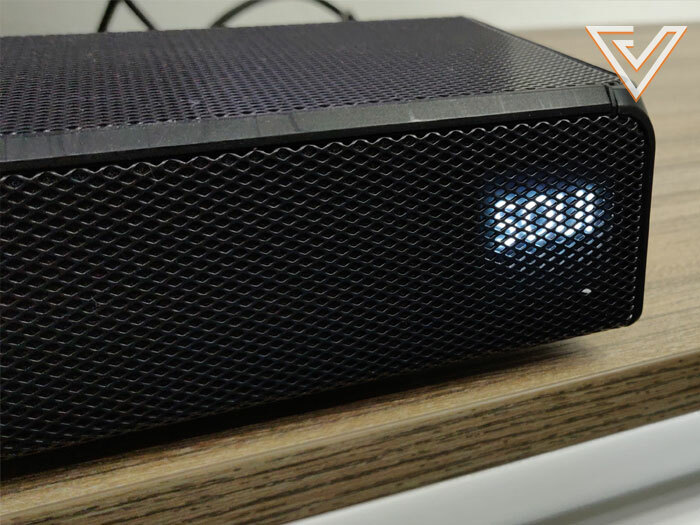 When Samsung decided to hand us a unit to try out for ourselves, we jumped at the opportunity to see just how well this one would hold up as a viable solution as a speaker system for the modern-day home theatre. For fans of unobtrusive design, the N650 will please. The two-piece setup is built mostly from brushed-metal and looks completely unassuming in front of a television setup with its all-black finish. The front facade of the main bar is covered by a metal grille that hides the high and mid-range tweeters and woofers and the small digital display to help you navigate through the menus and settings. Behind the N650’s main bar are a number of ports that sit in two recessions. 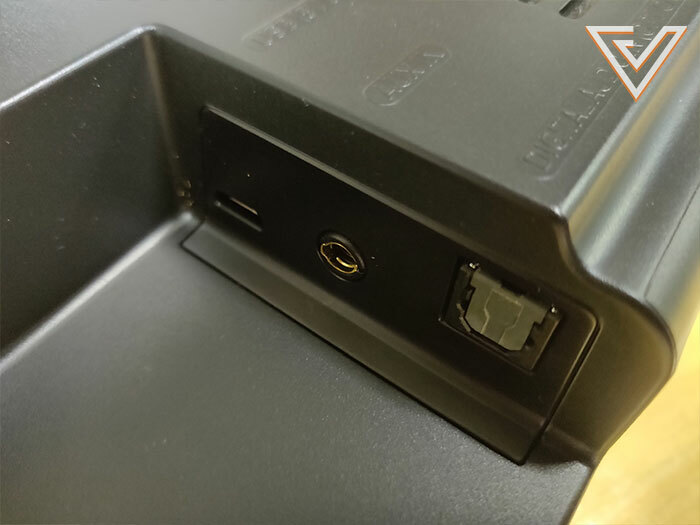 Here you’ll find the standard power supply, two HDMI ports—one with an Audio Return Channel (or ARC) protocol, a 3.5mm aux jack, a USB port, and an optical audio input. In terms of ergonomics, the N650 is incredibly easy to set up and use. Though there are a number of options available for connectivity (including optical audio and an aux cable option), I found that the simplest way to get it up and running was just by plugging it into the TV via the HDMI connection with the ARC and letting it all just go to work on its own. 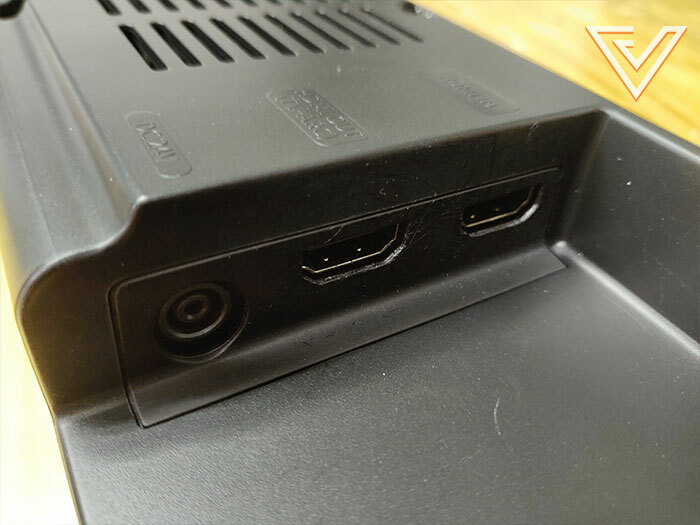 The ports on the N650 are located in a recessed area making it easier for cable management. There are options for HDMI, Aux, or Optical Audio. The accompanying subwoofer also pairs immediately with the main bar and there was really no issue in getting the whole set-up to work. In terms of audio quality, the N650 is full of presence, with the lows and mids more than adequate for blockbuster flicks and action-packed video games, and the highs still managing to come through without appearing lost in the mix. And with regards to amplitude, the 360 watt rating ensures that there’ll be no lack when you want to go loud. If we’re talking about selling points, the SoundBar sells itself as one for the gamers and movie buffs, boasting a technology it calls Acoustic Beam. This supposedly helps create a bigger and more immersive soundstage by firing the high-end frequencies into a pipe with 28 different holes (much like a flute). Each hole is aimed at a different direction to help recreate a surround-sound environment without actually having the components of a 5.1 or a 7.1 set-up. It’s worth noting that even without the separate components, the N650 is still mapped to a 5.1 configuration. 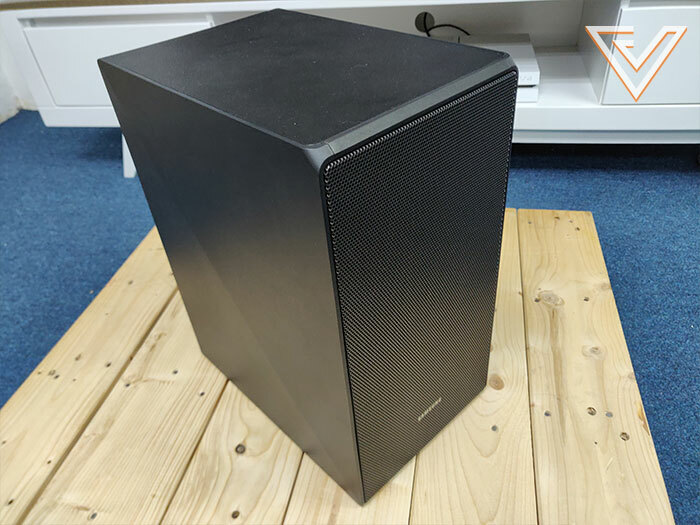 This means that there are three front firing speakers (in addition to the Acoustic Beam system, with a dedicated centre speaker especially important if you want to watch documentaries or Taiwanese dramas with plenty of dialogue or narration. The N650 comes with three audio options—Standard, Surround, and Gaming, each suited to a specific type of experience. For the Standard mode, the N650 only utilises the front three speakers and turns off the Acoustic Beam feature, making it ideal for music listening and watching content that does not utilise surround sound. In Surround mode, the N650 strives to immerse the viewer as much as possible using the Acoustic Beam feature. When watching snippets of Captain America: Civil War, dialogue during the quiet scenes were clear and full of mid-range presence, while the action scenes (especially that huge airport battle) were full of vibrant and wide soundstaging that for a quick second I almost believed I was listening to a system with the full gamut of surround speakers. The same surround-staging is present in Gaming mode, but here the N650 just slightly tries to place a bit more emphasis on things like sound effects and sudden noises to give gamers that extra bit of spatial awareness—especially great for playing games like Call of Duty or adventure titles like Tomb Raider. If I had to call out one gripe I had with the N650, I’d maybe single out its tendency to produce a bit of a wet and messy sounding mix when there’s plenty going on on-screen. Looking from the point of view of the everyday consumer, the N650 provides a listening experience that can be best described overall as “pretty nice”. 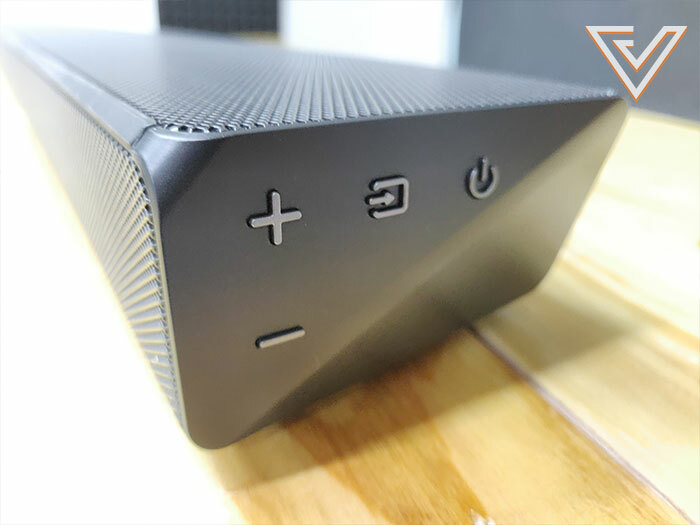 Sure, while the market is now beginning to heavily populate with soundbars in a similar mould, consumers looking to adopt one for their living room will probably be quite content with what the N650 has to offer. Strictly speaking, the sound quality it delivers isn’t best-of-class (judging from the small number of other similarly-priced soundbars I’ve come across), but the main draw here is really the immersive experience that you can get even without having a set-up with multiple speakers docked around your living area. Plus, with the ease-of-use it offers, those looking to get something that can easily work right out of the box can’t go wrong with the N650. To find out more about the Samsung SoundBar HW-N650, check out the official website.